Don’t you find her pretty? She is. 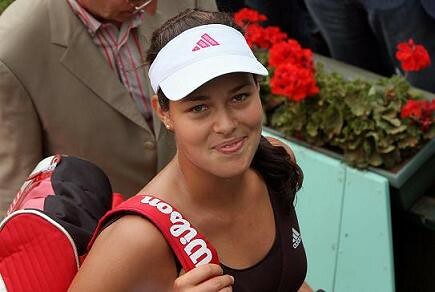 I hope you watched her semi-final match against Maria Sharapova. If you had to choose one to date on a romantic, candlelit dinner, who’d it be? The blonde or the dark-haired beauty? I know my favorite dentist, Dr. Nonito Narvasa, will choose Maria (he’s professed obsession over her), but I’ll go for Ana—not Anna Kournikova—but Ana Ivanovic. The Maria versus Ana match was all about height. Aren’t they tall? Maria stands 6-f00t-2; Ana is 6-foot-1. Wow. Haven’t the girls grown taller and taller? There’s Venus Williams, who’s 6-foot-1 ½. Lindsay Davenport stood at 6-foot-2 ½. And, would you believe, Akgul Amanmuradova of Uzbekistan, who reached the second round of the French Open, is 6-foot-3! Now, here’s the conclusion: if you’re not tall, you can’t be a champion. And since Filipinos aren’t tall, then, we should forget tennis. Right? Wrong. Look at Justine Henin. She’s thin, small, weighs just 126 lbs. and stands only 5-foot-5 ¾. And yet, she’s the world no.1. And, for the third straight year, she won the French Open crown last night. I saw most of the women’s finals last night. Ana started very well. She broke Henin’s serve to lead 1-0. In the second game, she was up 40-love. And that’s when it all happened. She missed her serves, hit forehands long, hit backhands to the net. She scrambled. She missed putaway shots. And, of course, little ol’ Justine played like a champ. The next thing I saw–and Ana realized–she was down 6-1 in the first set. In the end, she lost 6-1, 6-2. Bad. But that’s not too bad. It was her first grand slam final. She beat Sharapova in the semis. And, lest we forget, she’s only 19. Because for me, if the contest were all about Parisian beauty, my champion—and that includes Ms. Sharapova—is Ana Ivanovic.